When it comes to clothing and toys for children it can be hard not to get too carried away when it comes to buying for them. I know from time to time I can be really bad at impulse buying especially when it comes to things for Blake. Now I'm starting to think more about saving any money where I can as one day we want to have another child and will have to think about moving to a bigger place. One of the ways to save money is on what I buy for Blake. 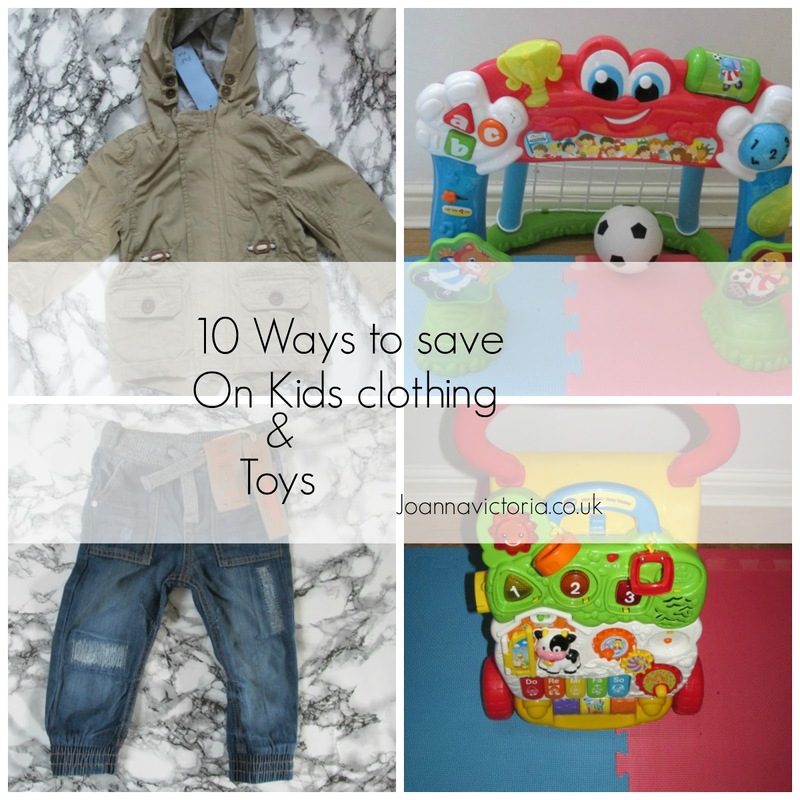 So here are some ways on which you can save money on clothing and toys for your little one. When it comes to Blake needing new clothes, shoes or toys then I try and do a budget. I look at what he needs and then decided how much I can spend. Most of Blake's clothing are second hand and I do a budget for what to spend on second hand clothing and new clothing. I also do this with toys, I've not had to purchase many toys recently as he got loads for Christmas and his Birthday which are pretty close together. I have however purchased books for him as he loves for me or Stuart to read to him. As children grow out of clothing so quickly most stuff are in Excellent condition so buying second hand is a great way to save money. I use Ebay a lot to buy clothing for Blake and charity shops and boots sales are also great places to find bargains. Supermarkets such as Tesco have a fab range in store and/or online and they tend to be much cheaper than shops such as Next for example. This also applies to toys as well. If your child needs for example a new pair of jeans shop around and see if you can find cheaper ones. If you are shopping online make sure you also factor in postage costs. It's pointless spending £6 on a pair of jeans if the postage is £3,99 and you can buy some in another shop for £8. For toys its a good idea to shop around as prices vary from store to store and sometimes Amazon works out cheaper. If you know someone who has a little one who is a little older and are getting rid of their child's clothing or toys and asks if you would like them, accept. I was passed on some clothing for Blake which he has worn and it's saved me a bit of money. This is pretty obvious shops have sales on throughout the year ready to get new season items in so why not buy in the sales and save £s in doing so. Toys also go on sale for example I knew I wanted Blake to have the Happy Land Train Set for Christmas and my Mum was going to get it him. I found it on the ELC website down to £22 from £50 and told her so she snapped it up whilst it was on sale. This kind of relates to buying in the sales. For example if after Christmas all the winter clothing goes on sale buy for the next year. I like to stock pile when I see a good offer on and I've already got Blake 3 of his presents hidden for Christmas/Birthday. If you think your child doesn't really need something he/she probably doesn't. Write a list of what is needed when it comes to clothing such as x3 Jeans, x3 joggers etc. I also make sure Blake has clothing that he can get messy in as well as the more nicer clothing. If you are planning on having another child it's a good idea to try and buy a few unisex items of clothing and toys. Most of Blake's clothing from when he was newborn are all unisex so ideal for when we have another child. Although Blake has toys such as trains, cars and football; I also plan on buying him dolls etc. If we have a girl one day she will be playing with Blake's toys and I have no problem with girls playing with trains and cars, just like I have no issues with Blake having a doll. I am a big believer in second hand and very often the younger kids toys are so big and bulky that friends literally give them away! I am also a big one for buying in the sales although it does work well with younger ones, it is more tricky when fashion rears its ugly head! second hand is the way to go when u have a tight budget. Thank you I hope the post has really helped you. I know that in my local area sometimes people put up school uniforms that their kids have grown out of on facebook selling pages for local areas too. Yes definitely coats I managed to get a winter coat for Blake recently that was in the sale at half price Bargain! Really great tips and ones which I follow myself. Kids clothing can be so expensive so I always try and wait until the sales to pick up new bits. Some fab tips, I'm always on the look out for a bargain and I am more than happy to buy second hand, saves an abundance! I think supermarkets are great for kids clothes. Second hand toys are fab too! I agree entirely. Also, make your own! Emma's been making dresses for the girls and they're beautiful. Some awesome tips here. I love buying "bundles" on Ebay. You get loads of clothes for a brilliant price and it's exciting going through them when they arrive. Very occasionally you get something you're not keen on but not often. Great tips thank you for sharing. I biggest takeway is to budget, because I awlays end up buying more most times. There are some top tips in this post. I often shop in charity shops, especially for toys! This is a great post. I buy second hand alot ! Even accept clothes for free too! I like the idea of accepting cast offs because I used to get so many clothes this way when I was younger. I buy most of my kids stuff in primary and asda because it's so cheap. Excellent tips. Awesome tips to explore here. It is very difficult to buy new clothes for kids every time on their growing age.